The beautiful but invasive predator lionfish has gained a firm foothold in the Western Atlantic and can now be found throughout the Caribbean, down to South America and as far north as the southern end of the Chesapeake Bay. The lionfish has proven to be the worst invasive fish outbreak in recorded history of the Atlantic waters. From the occasional sighting in the mid ’80’s through the ’05 period the lionfish struggled to establish themselves, finally ballooning their population in the past decade. Now lionfish can be found in their new territory in almost any depth and on almost every reef and structure in their range. It seems that this same pattern is now happening in the Mediterranean. The first sighting of a lionfish in the Med occurred off of Israel in 1991, but it was another 21 years until two more were spotted near Lebanon in 2012. Now a new report shows an established group of breeding lionfish have made their home along the southeast coast of Cyprus. It was originally believed that the waters were too cold to sustain a year round population of the invasive lionfish, but the hearty critters have once again shown an amazing ability to thrive in new waters where they have no predators and consume prey that have no natural understanding of how dangerous the lionfish is to them. It appears that the species in the Med is the Pterois Miles species which is less common in the Atlantic than the virtually identical Pterois Volitans. Demetris Kletou, of Plymouth University’s Marine & Environmental Research Lab, said within a year researchers found that lionfish had colonized much of the southeastern coast of Cyprus. “Until now, few sightings of the alien lionfish have been reported in the Mediterranean, and it was questionable whether the species could invade this region like it has in the western Atlantic,” Kletou said in a statement. The widening and deepening of the Suez Canal may also be allowing lionfish to make their way into the Mediterranean, according to the study. Divers have shown in the Atlantic that we can control the lionfish on our shallow reefs where we frequently dive, and we are starting to see that the lionfish are beginning to avoid the areas where we frequently hunt. Perhaps it is time for Mediterranean divers to start hunting them and putting the delicious lionfish on the menu as we have done in the Atlantic. So far the documented number of lionfish off of Cyprus is small, only 19 lionfish, so lets hope that the Med invasion can be nipped in the bud before it reaches crises level as we are seeing in the Atlantic waters. Because the lionfish are so hearty and have such an incredibly fast and prolific breeding cycle, those in the Mediterranean will require close monitoring and intense efforts from divers. In a sad new development, it appears the lionfish are spreading westward through the Med and have now been spotted in the waters off of Sicily. Lets hope that the lionfish invasion in the Med does not follow the same devastating path that the invasion of the western Atlantic followed. So far though, it seems that once the lionfish gains a foothold it is there to stay. Congratulations for this clever and foresight analysis. I do think exactly the same. I couldn’t agree more as a recreational diver from Turkey. I would like to hunt them so much; yet, there are no diving centers that let you hunt them, there are not even a single restaurant serving lionfish as far as i know. The thing is you don’t see more than 6-7 lionfishes in a single dive which would make hunting dives cost a lot. 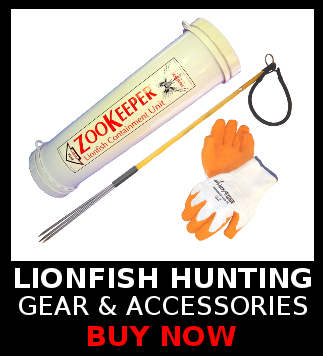 Still, I would like to contribute to beggining of lionfish hunting in Turkey. I’m open for all the advices.